Imagine having just a few minutes to take your spouse outside where you can embrace, reflect, and have a quiet moment to yourselves, while the celebration is still going on at the reception. This romantic moment was taken at the Rose Briar Place: a premiere Oklahoma outside venue right in NW Oklahoma City. Robert, one of our lead associate photographers, followed the couple out. Robert, who is a spontaneous photographer, had just a quick moment to set up his light, and pick a complimentary lens that fixated on them while showcasing the festive decor and the blue night sky. This captured the personality of the moment and the location for the bridal couple. After all, it is your day to come out and enjoy those intimate moments, just like how this bride and groom did. The portraits of your day may show a variety of poses, both candid and posed, that include precious moments that truly capture the emotions. 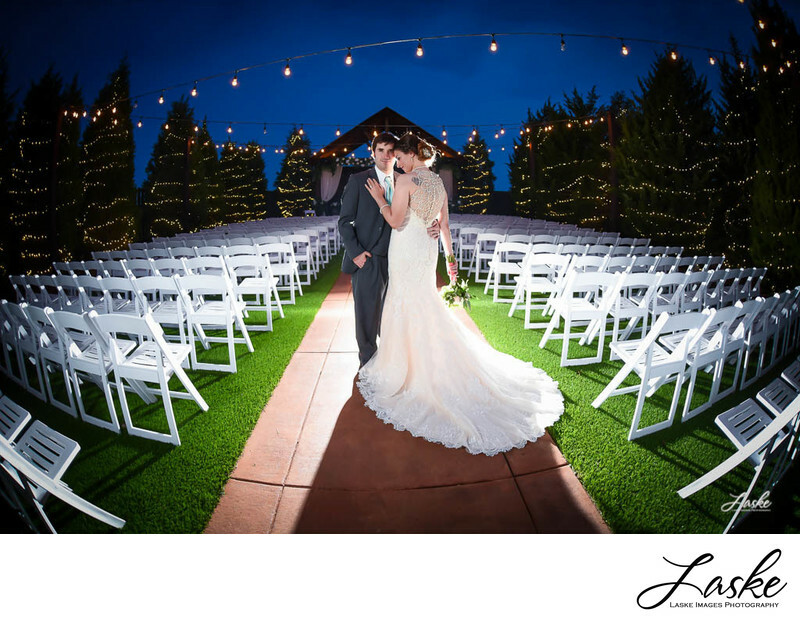 It is important that wedding photographers stay prepared to handle all lighting conditions while having very little time. On your special day, these are the types of images you can see in the series of creative images you receive when we provide coverage for you.